Real, fresh cut Christmas trees bring the traditional smell and warm glow to your room during the Christmas season. Buying and setting up the tree, on the other hand, can be one of either fun and memories, or trial and tribulation....and memories. Everyone has at least one story to tell. I will never forget one year when the kids and I went out and picked the absolute best tree we have ever seen, and cut it down. We loaded it onto the van and drove home, singing Christmas carols along the way. Well, I drove the Christmas tree right into the garage...err, literally. Years later, we still laugh about that Christmas tree, as it hit the roof of the garage and tore right off the van, along with part of the van roof rack. Did you know? Some people are allergic to pine. Don't know if you or a family member has this allergy? If you've walked through a pine forest without ill effects, you're most likely okay. If you've worked with pine bark in your garden without problems, you're okay. If, you and the family have been exposed to Christmas wreaths or trees while shopping, you're probably okay.... Get the picture? 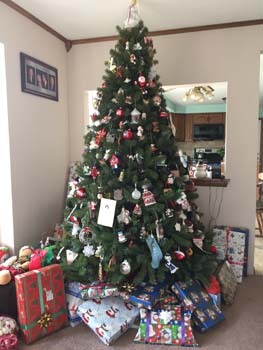 Selecting the Perfect Christmas Tree There are several important things to do when seeking, picking, and putting up the perfect tree. Type of Tree - What is your idea of the perfect tree? What type of Christmas tree fits that vision?. There are many types of trees to choose from. They are Fir, Pine and Spruce trees. Within these types of trees, there are many varieties. See: Varieties of Christmas Trees. Prepare for the tree by determining the maximum height and width of the tree. Measure the height of the room, from floor to ceiling. Then, subtract for the tree stand and topper. Bring the tools you need, including a saw, measuring tape, and rope. Select a tree.. Let the family pick the perfect tree. Tall or short, wide or narrow. Thick and bushy or a Charlie Brown tree. Whatever the family wants, the family gets. Examine the tree for health. Before you cut it down, spend just a couple minutes making sure it will cause you no problems when you get home. Make sure the trunk is straight. A crooked trunk can cause the tree to be tilted in the stand and worse....fall over. Check to see if the trunk at the base is wider than the stand you will use. Imagine the trunk fitting into the stand and determine if you will need to cut any of the branches off the bottom.If so, imagine what the tree will look like without those branches? Will a hole or gap result? Check the needles to see if they are dry. This is almost never a problem, if you cut your own. But, trees found at Christmas tree lots, were cut weeks ago. Bend a few needles back. If they come off easily, the tree is to dry. As a second test, pull on a few needles lightly. Your final inspection is for bugs. Cut the tree down. Saw as close to the ground as possible. Cut at a very slight angle. When you bring it home, keep it in the garage or outdoors until you are ready to put it up and decorate it. Putting up the tree starts with getting the right base. Avoid the temptation to go cheap on this item. A small or inexpensive base can cause the tree to tip over. On the day you are going to put up the tree, take a fresh cut off the bottom of the tree. Cut about an inch off at a slight angle. This fresh cut allows the tree to absorb more water. Before bringing it indoors, shake it thoroughly to remove dead needles. As soon as you put it in the base, add water then check and re-fill daily. Decorate and enjoy. Care and Maintenance translates to a longer lasting, and safer tree. Keep it watered. Never letting the stand to dry out. You should also close and heat vent that is right new the tree. Keeping the room cooler at night also helps. There are some products on the market which claim to help trees stay fresh longer. Other home ideas include adding a little sugar to the water and adding an aspirin.Whether you experiment with any of these, it's your call. 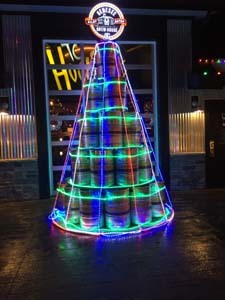 The Genesee Brewing Company in Rochester, NY boasts a lighted Beer Keg Christmas tree. It stands outside the Genesee Brew House. 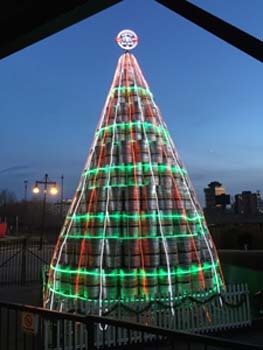 The Beer Keg Christmas tree is 27 feet high, 12 layers, and is made of 520 empty half kegs. Every year there is a tree lighting ceremony, with thousands in attendance. Their sister brewery, Pyramid Brewery in Seattle, Washington has also started the tradition. Their lighted Beer Keg Christmas tree stands 20 feet tall. More on the Beer Keg Christmas Tree.